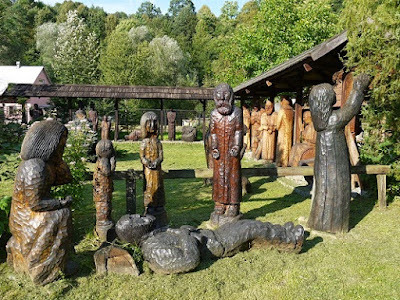 Boguslawa Iwanoskiego (Boguslav Ivanovski), who created this art environment, was born in 1934 in Dorhun (district Grodno), a community that currently is part of Belarus but which before World War II belonged to Poland. The shift of the border between Poland and Belarus, which took place after World War II, resulted in the russification of Ivanovski's birthplace, such as collectivisation of agriculture. Opposition of villagers was brutally oppressed, Ivanovski's father was imprisoned, his brother was executed and he himself, although rather young was deported to Russia, where he for a number of years had to work in a labor camp. In later years while still staying in Russia, he succeeded in doing a training as a car mechanic. Ín the early 1960's Ivanovski returned to Poland. In 1961 he settled in Szczecin, a harbour town located along the Oder river and near the Baltic Sea in the north of the country. He got a job as a service technician at the local public transport company. In the course of the 1960's Ivanovski as an amateur artist began to develop his artistic talent, initially in the fields of poetry and painting, but soon turning to making wooden sculptures, which would become his lifelong passion. He became a member of the Klubu Plastyków-Amatorów i Twórców Ludowych (Club of amateur painters and folk artists) that would meet in the provincial House of Culture. He took part in various expositions, including one in the context of the in Poland well known Centralne Dożynki (Central Harvest Festival). 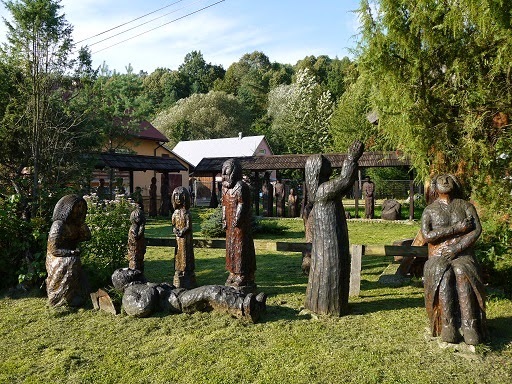 In 1986 Ivanovski moved from Szczecin to Tyrawa Woloska, a village that reminded him very much of his native region. 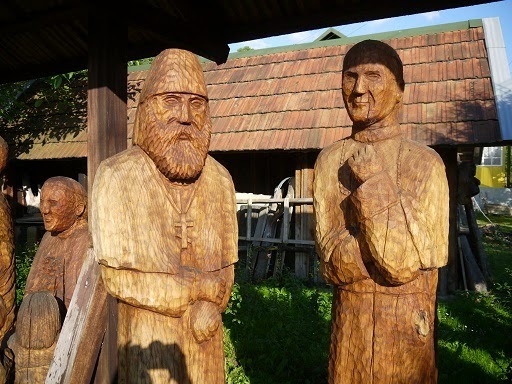 Here he would stay for the rest of his life, fully devoting himself to making wooden sculptures and setting up an open-air exhibition area. Ivanovski has created an imposing amount of artwork since in the mid 1960's he began making folk art. 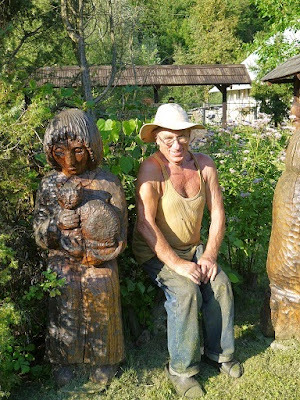 His wooden sculptures, made in several sizes, including a number that are larger than life, have a naturalistic character and are sculpted in a classical folk art style. His work reflects his attachment to his native Poland. The collection, divided between the house and the outdoor exhibition area, includes sculptures and sculpted reliefs which refer to important personalities and happenings in the history of Poland, such as Polish kings and princes, the statesman Józef Pilsudski (a series of works depicting various stages in his life) and the Katyn Massacre. 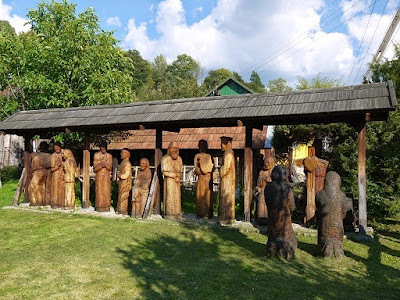 Another series of sculptures is devoted to Pope John Paul II, altogether some 24 monumental sculptures. 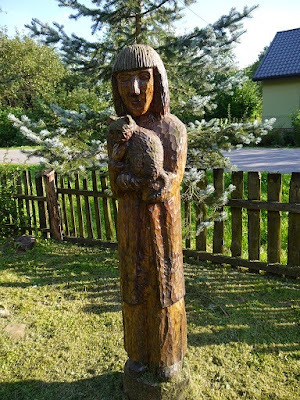 But one can also see characters derived from fairy tales and all kinds of portrayals of common people, such as the one of a young lady with a cat in her arms. Ivanovski currently (2016) is in his early eighties and processing wood is becoming rather hard for him to do, so he is considering switching to other artistic approaches, such as making ceramics or working with concrete. Ivanovski's sculpture garden can be visited by the public. 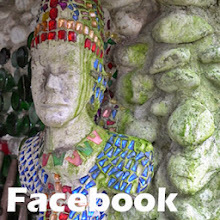 It attracts a lot of visitors and when at home the artist is gladly willing to inform visitors about his work. In march 2016 on the occasion of the 50th anniversary of his artistic calling, the chairman of the parliament of the Podkarpackie voivodeship (province) awarded Ivanovski with a bronze medal Gloria Artis. Уважаемый Хенк спасибо. Хорошо найти живопись.Спасибо.